Please pardon me, if I am mistaking the poem. Talking in such a whisky frisky manner that nobody can understand him. I also think I found another example here. And again here (although it might be a reference to alcohol, I’m not sure). Interestingly, the expression “whisky-frisky”, spelled with a hyphen, is an example of a reduplication, albeit very rare. Similar to binomial pairs, reduplication is usually two words but which rhyme together, e.g. hoity-toity, jeepers-creepers, pitter patter, and topsy-turvy. In the English language, whisky-frisky stood for someone drunk on whisk(e)y and probably unsteady on their legs, so quite the opposite of a sprinting squirrel! The author of the book History, meaning and the sheer joy of words, Vivian Cook, says it is of American origin and is virtually obsolete. She also lists other examples that are mostly forgotten: kitch-witch, holums-jolums, and hitherum-ditherum, note the hyphen that joins the two words together, this is missing from the poem cited by the OP. However, the poem The Squirrel is filled with reduplicative expressions that small children find particularly appealing due to their quirkiness and rhythmical beats. EL&U has many questions and answers dedicated to this fascinating linguistic phenomenon, I would warmly recommend the OP to delve into its archives. As other answers have pointed out, this particular example of rhyming repetition dates back at least as far as the 18th century, being used in "The Race," a satirical poem by Cuthbert Shaw (1766), who considered it one of his "favourite words" (see footnote). 49A favourite word of this author. See Education, a poem. It was also used in volume three of Cecilia, a book in five volumes by Frances Burney (1782), and in a rhyming chorus in "The Highland Reel," a 1788 farce by John O'Keeffe. Lilting up the Highland Reel. 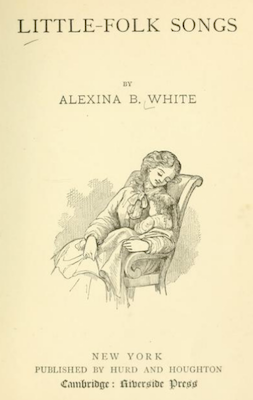 The "Whisky Frisky" poem itself appears in an 1871 children's book, Little-Folk Songs, by Alexina B. White. 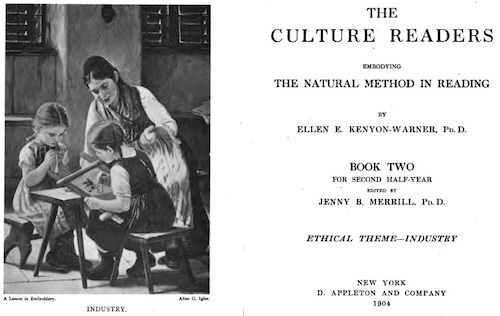 Around the previous turn of the century, the poem was included in a children's reading primer series, The Culture Readers: Embodying the natural method in reading, by Ellen E. Kenyon-Warner, Pd.D. 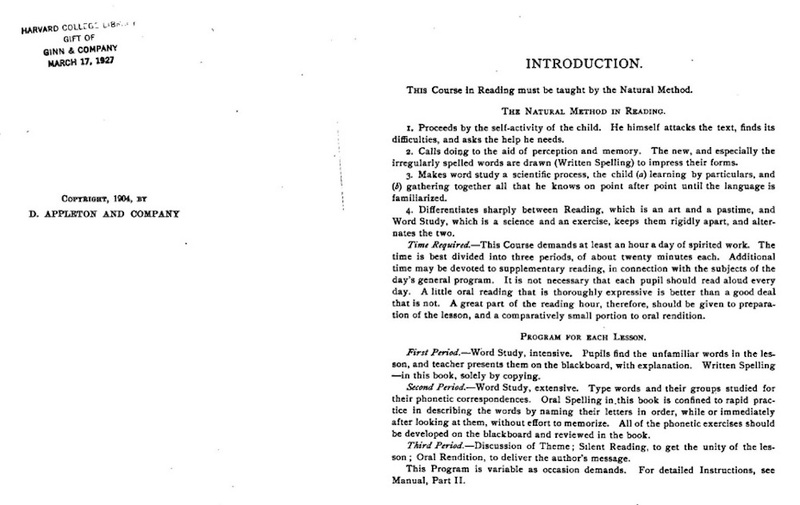 (Doctor of Pedagogy), in a volume aimed at the "second half year". This "natural method" involves the child reading texts of interest and performing targeted study of words encountered in their reading. 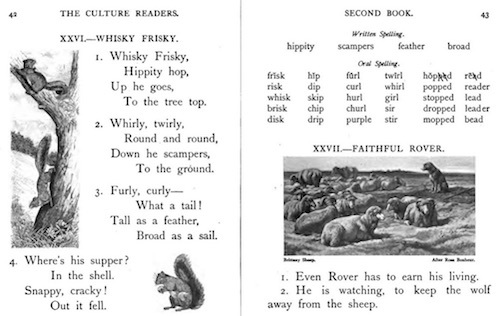 The "Whisky Frisky" poem is presented with a list of related vocabulary words, some of which appear in the poem and others of which are related through rhyme or similar spelling lessons (e.g. silent A in read, lead, bead). This is complete nonsense, but it sounds like English and "feels" right to a reader. Just based on the sounds and shapes of the words, they bring to mind possible meanings, and more importantly convey the emotion and feeling of the fantastical world where the Jabberwock lives. In this poem, "whisky" may be used just for its sound and similarity to the word "whisk", which as Pelinore points out means sudden and quick movement. The "-y" suffix makes it sound even more light and playful, and it rhymes with "frisky". It seems that even when this "whisky frisky" phrase was being used in the 18th century, there was discussion over what it might mean. In 1787, George Colman "the Elder" published a work titled Prose on Several Occasions; Accompanied With Some Pieces in Verse. In Volume II of this work is a parody called "Letter from Lexiphanes, containing Proposals for a Glossary or Vocabulary of the Vulgar Tongue, intended as a Supplement to a larger Dictionary." There are in every language, ancient and modern, certain heterogeneous words and anomolous expressions, which render it more difficult to be acquired by students and foreigners than even the most licentious idiomatick phrases, or the most irregular combination of sentences. To remedy this defect in English Literature, I have, with infinite labour, compiled a Vocabulary or Glossary, intended as a Supplement to a larger and more solemn Dictionary. It is easy to foresee that the idle and illiterate will complain that I have increased their labours by endeavoring to diminish them, and that I have explained what is more easy by what is more difficult -- Ignotum per, ignotius. Philological Disquisitions are but ill adapted to the readers of a sugacious paper. Having, therefore already given a sufficient indication of my purpose to the Philosopher, the Academick, and the Scholar, I shall at present add no further interpretations; but in order to convince the learned of the Necessity and Importance of the work announced to them, I shall somewhat enlarge the catalogue of terms that demand explication; which like base metal among legitimate coin, have, by long usage, become current in our language; and without which the commerce of the world, or even the traffick of letters, can with difficulty be maintained either with profit or delectation. To explain them may be some glory: it would be more substantial fame to contribute to their extirpation. He who writes the Dictionary of any Tongue, may be considered as labouring in a coal-mine; but he who collects the Refuse of a Language, claims more than ordinary commiseration, and may be said to sift the cinders. The name "Lexiphanes" is a wordplay on the Greek words for "word" and "show" or "appear." It might be worth noting that in the 18th century, the adjective "whisky" was not a nice way to describe someone. T. Is't think on ot teaw looks o bit whisky, chez whot Seroh o'Rutchot's is. M. I yeard um sey ot gexing's o knit' lying, un ot proof oth' pudding's ith' eyghting. -- So fareweel, Tummus. 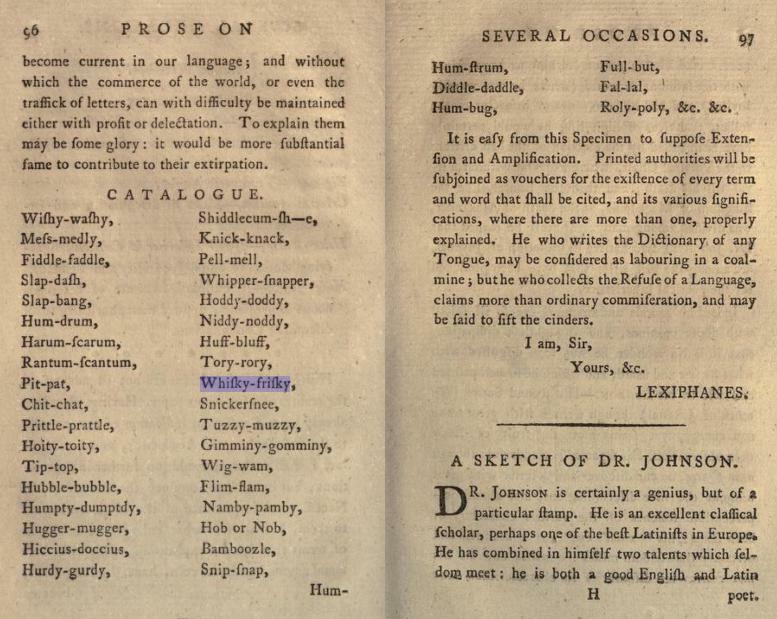 A mid-19th-century revision by Samuel Bamford of the latter work, titled Dialect of South Lancashire: Or, Tim Bobbin's Tummus and Meary ; with His Rhymes and an Enlarged and Amended Glossary of Words and Phrases, includes a glossary that defines "whisky" as "frisky" or "immodest." A similar revision by a different mid-19th-century author, John Corry, defines "whisky" as "whorish." Good answers in the other two but I think you (or at least some) might benefit from an answer in simpler terms, the "whisky" in the poem is derived from the word whisk. take or move (someone or something) somewhere suddenly and quickly. The author has simply added a few letters to it so that it rhymes with frisky. For totaly clarity but also not to contradict at all the other great and well researched answers, no, you cannot use 'whisky' to describe a squirrel going up a tree. The whisky squirrel retrieved a number of acorns before coming back down. The squirrel was very whisky. to a modern reader (and most likely from past centuries, would wonder what why would you talk about a drunk rodent like that. A whisky-soaked squirrel? A squirrel that looks like a whisk? Used by itself, 'whisky' is either a misspelled liquor used strangely, or a weird way to say it looks like a whisk. Either way, it'd be a cumbersome unnatural (almost ungrammatical) way to say it. Yes, it has all those past usages, but no, you don't really want to use 'whisky' the way you suppose in your title. Not the answer you're looking for? Browse other questions tagged meaning poetry or ask your own question. what's the meaning of “tree”? Can the word “appeasing” be use to describe pleasant objects?